Hyundai Motor Group and Grab Holdings Inc. (Grab), Southeast Asia’s leading O2O (online to offline) mobile platform, announced an agreement under which Hyundai Motor Company (“Hyundai”) and Kia Motors Corporation (“Kia”) will invest an additional US$250 million (P 13.15 trillion) into Grab and establish a partnership to pilot EV programs across Southeast Asia. Under the EV partnership, Grab and the Hyundai Motor Group affiliates will bring together stakeholders from the EV industry to collaborate on measures to improve EV adoption and awareness in Southeast Asia. To start, Grab, Hyundai and Kia will launch a series of EV pilot projects in Southeast Asia starting with Singapore in 2019. The pilot projects will focus on utilizing EVs to maximize cost efficiencies for Grab’s driver-partners. The EV partnership will also work with regional stakeholders including governments and infrastructure players to improve EV infrastructure in the region, such as the building of a network of quick-charge stations. The EV partnership will also explore the development of customized maintenance packages to Grab EV drivers and conduct research into how EVs can be most efficiently deployed in Southeast Asia under hot and humid climate conditions. “As the largest fleet owner of EVs in Singapore, we are excited to establish an industry partnership with Hyundai Motor Group to drive EV adoption across Southeast Asia. We both share a common vision on the electrification of mobility as one of the key foundations for building an environmentally sustainable and lowest-cost transportation platform,” said Ming Maa, President of Grab. The three companies will also explore how to customize EVs to optimize them for mobility service platforms. Hyundai first invested in Grab in January, and the two companies began exploring collaborations in the EV sector. 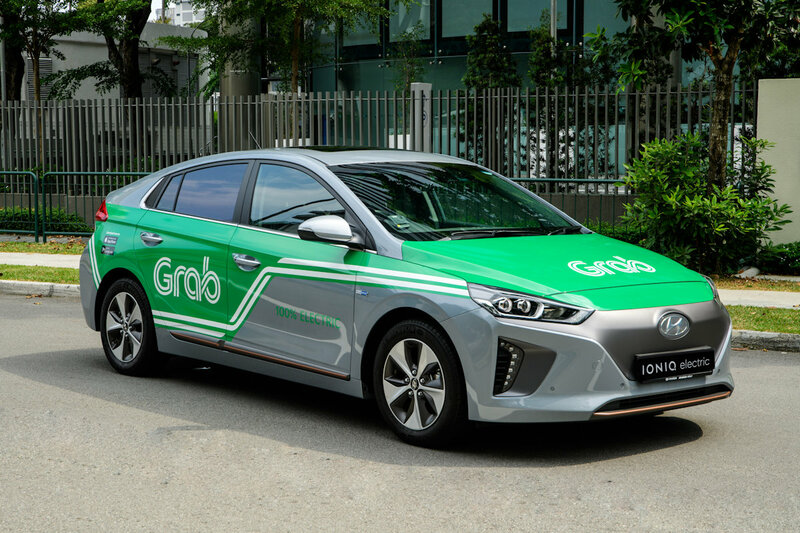 Grab’s latest initiative, which expands its cooperation with the Korean automotive group to include Kia, is a milestone in the company’s continuing efforts to promote the use of EVs in Southeast Asia. In August, Grab announced a partnership with Singapore’s energy utilities provider, SP Group, to use SP Group’s public EV charging network for its EVs. With a commitment to driving innovation that will enhance its foothold in the future mobility market, Hyundai and Kia have been making significant strategic investments in promising start-ups. From technologies such as autonomous driving and artificial intelligence, to ride-sharing and things in-between, Hyundai Motor Group is building a network of industry experts that will contribute to enhancing people’s lives through the development of innovative mobility services. In line with its goal of becoming a leader in clean mobility, the Group also plans to develop more than double the number of its eco-friendly models to 38 by 2025. Grab is one of the most frequently used mobile O2O platforms in Southeast Asia, providing everyday services that matter most to consumers. Today, the Grab app has been downloaded onto over 125 million mobile devices, giving users access to over 8 million drivers, merchants and agents. Grab has the region’s largest land transportation fleet and has completed over 2.5 billion rides since its founding in 2012. Grab offers the widest range of on-demand transport services in the region, in addition to food and package delivery services, across 235 cities in eight countries.